Stuffed Karela is my second love the first being Karela or Bitter gourd itself. So when Vatsala here decided to hold an event “Lets Get Stuffed” I could not help stuffing myself. For my husband the man who suffers most of my experiments steered clear off the table. J Don’t blame him he just tolerates the bitter gourd!! This recipe is by no means original so if you have any suggestions please send me a line. I am sure it will taste very nice if you can get the small bitter gourds since my “sabji walla “gets only these huge ones I used them! But mind you they are bitterer than the smaller ones. I had some of the ground paste left over from the paneer bhindi masala which I had frozen which I used to make this veggie and hence it was super quick. 1. Make a slit in the bitter gourd and scoop out all the seeds. You can use a teaspoon if needed. 2. Rub salt in the bitter gourd sprinkle salt on the gourd and the seeds. 3. Let the gourd rest covered for at least 12 hours. 4. Mash the potatoes add a pinch of salt and mix with the fried paste. 5. Soak the bitter gourd in water for about 10 minutes then squeeze the water out. 6. Next since I am not a fan of deep frying I transferred the bitter gourd in a microwave proof dish with just sufficient water to cover the gourd and micro for 2 minutes or till the colour of the gourd changes. Again squeeze out the water carefully. This is optional step. 7. Stuff the gourd with the fried paste and potatoes mixture and fry in a kadhai/wok using oil as required. 8. Here I served it in a bed of cabbage and some tomatoes. Sending this to Vatsala’s Event. Wowww… Lovely and delicious recipe.. Looks gr8 !! Thanks Divya and Prathibha love you girls. Will try your version too!!! 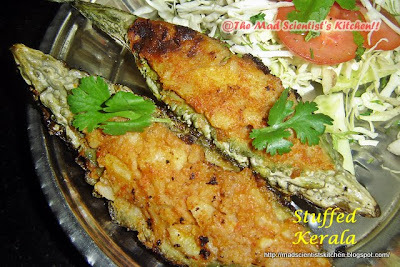 Delicious looking stuffed karela. Looks so fulfilling. Delicious stuffed karela…My hubby wud be very happy if I make this..
wow, this is so amazing, never had or tried these, looks superb dear..
That is a great stuffing and simple to make curry. Thanks all of you. Your comments are sweet.